Imagine how sweet it would be if you could have all of the ice cream you ever dreamed of. For twelve-year-old, Patrick, dreams like that are a reality. Dream seekers don’t feel like they’re in dreams, they are in them. It’s not fun waking up with a stomach ache from eating too much food or opening his eyes to a painful sunburn. Patrick must slowly learn the dream rules and learn how to exit his dreams at the right time. Patrick finds himself captain of a starship. When he lands at the docking station, he finds his two best friends and his Mom. He discovers they are under attack. It is up to him to find a way to save the crew before awakening. FRIGHT FLIGHT by Lisa Ard is book one in the Dream Seekers Series. The book bridges the gap between the chapter book and middle grade. The fast action appeals to those reluctant readers with short attention spans. The book is short, but filled with great vocabulary for the early middle grader. I would have loved to had a little more development of the what or why of becoming a dream seeker. At the same time, I think the length of the book attracts the reader who isn’t quite ready for something longer, but still has a relatable older central character who will make the reader feel like they aren’t reading below grade level. 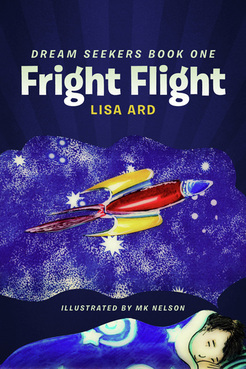 Fright Flight would make a good addition to the 2nd-5th grade classrooms. Ages 7-10. Publisher: Puddletown Publishing Group, Inc.
Do you want to win a paperback copy of this book? Please use the Rafflecopter form to enter. If you have trouble getting the form to load, click the blog post title to reload it. Contest ends Jan. 8, 2012 at 10:01 MST. It's hard to believe Christmas is only a month away when it's sweltering hot in Savannah, Georgia.﻿ James Lord Pierpont struggles to get his mind off the heat and the conflict of his Unitarian church's anti-slavery and focus on the task of writing a song for the annual Christmas concert. When his daughter asks him what snow is like, Pierpont receives the inspiration he needs to start his song. He wants his congregation to know what it is like to go for a sleigh ride as he did during his childhood in Boston. With the sound of jingling bells on his mind, Pierpont ends up writing the classic, "Jingle Bells." 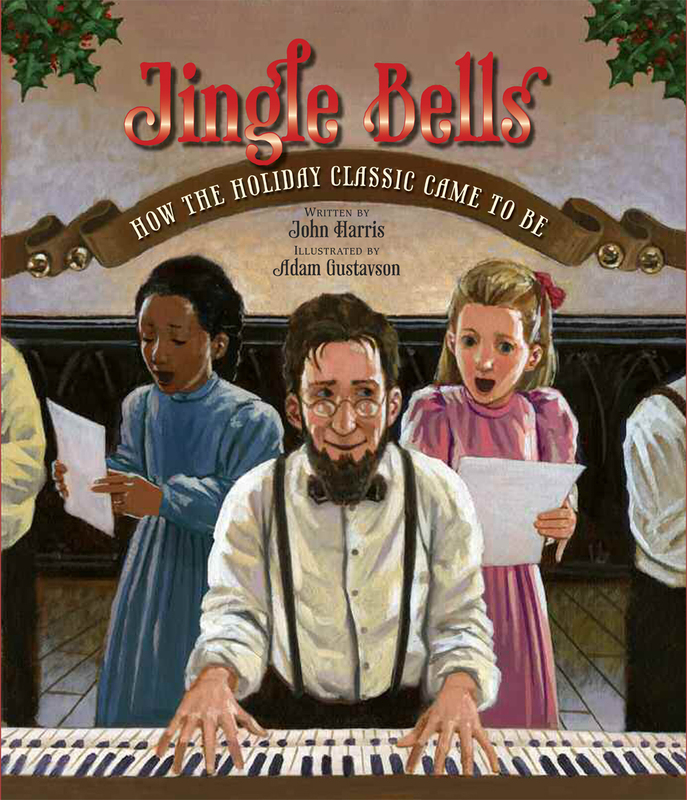 Author John Harris explains in an imaginative and believable way of how he came up with the fictional account of the writing of "Jingle Bells." The lively illustrations by Adam Gustavson fit well with the upbeat music of the beloved song. I love holiday books that make reading aloud fun. This book does just that. Recommended holiday read for anybody who loves the Christmas classic, "Jingle Bells." Ages 4 and up. This book is available through the following retailers. Labels: jingle bells how the holiday classic came to be book review. Thanks for having me here today. It’s wonderful to join you and your readers and visit about my book Ghost Dog of Roanoke Island. Where did you first learn of the "lost colonists of Roanoke Island and what made you decide to write a book about them? I admit I never thought I would write a ‘historical’ fiction story. I hated history as a kid. Too many dates to remember. Besides, what did history have to do with what happens today? Now I understand, history has EVERYTHING to do with what happens today. 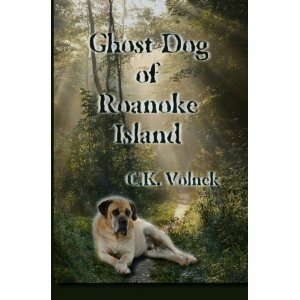 The idea for Ghost Dog of Roanoke Island came after I read a news article about the Lost Colony. I was so intrigued with the mystery, I continued to research to find out more about this mystery. How could all these people just disappear? Then I read about how Richard Grenville and Ralph Lane destroyed a Native American village just because they thought one of the Native Americans stole a silver cup. My muse was so appalled she had to come up with her own version of what happened to create a story evoking the value of acceptance and tolerance and the power of forgiveness. 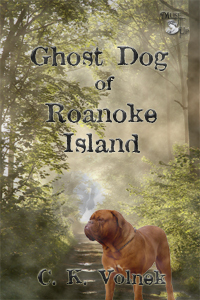 How long did it take you to do the research for The Ghost Dog of Roanoke Island? The research was the fun part of this story. I spent about two months researching the information before I began writing. But I continued to research as I wrote, even adding actual names I found from the manifest of the original colonists and other valuable information regarding the history of Roanoke Island. What was the hardest thing you encountered in writing your debut novel? The hardest part of writing is my own self-doubt. I love to write, but like many authors, I am my own worst enemy when it comes to doubting oneself. That little internal editor in my head sprouts horns and pokes at me with his sharp pitchfork. I’m blessed to have not succumbed to him this time. Why did you choose a mastiff as the ghost dog? That is a great question. The reason I chose a Mastiff is during my research I read an article about the dogs that came over on the Mayflower. A Mastiff and Spaniel are mentioned in historical documents of that voyage. Mastiffs were quite revered by the English and I was impressed how they would have brought one over to the New America. I have met several Mastiffs and they are the most loyal and trustworthy dogs as well as strong and the breed was the epitome of what I wanted my dog character to be like. So, for me, there wasn’t a choice what dog I would choose, it was determined by history. What was your favorite part about writing this book? My favorite part was weaving the folklore and the true mystery together. It was a bit of a challenge, though a fun challenge at that, and the pieces fell together like a puzzle. Have you always been interested in history and historical legends? If so, tell us some of the others you are fascinated with. As I mentioned, I used to hate history. But now I am so intrigued with it. I recently was asked if I could go back in time, where would I want to go. It was so hard to choose one time! What was it like to live as an early colonist? What was ancient Rome like? How did the shepherds feel when the angels filled the heavens with song at the birth of Jesus? So much fascinating history. I also love a good mystery. And history is abundant with wonderful mysteries. One legend I am working on researching is the ‘ghost dog’ of Saint John Bosco. This dog appeared from nowhere and protected Bosco when needed, only to disappear until his protection was needed again. Have you traveled to Roanoke Island as part of your book writing and research? I admit, I have not traveled to Roanoke Island, though I did research the geography, flora and fauna of the island. I have tried to stay as true to the facts as I can, though I did add a small rise in my story to allow for the cave. Most of Roanoke Island is very flat so this was a small author liberty. Growing up, which authors inspired you the most and why? I loved to read as a kid. But it was after reading Anna Sewell’s Black Beauty, I knew I wanted to become the next great writer. It’s taken me a little longer thank I had planned to be published, having to set my goals aside for my family, but I’m glad I never gave up on my dream. Did you dream of becoming a writer when you were younger or decide you wanted to do it later? I have always wanted to write. But life took me in another direction for a while. I got married and had children and my writing was limited to short stories and articles. I needed the security of a regular kind of job so I used my creative abilities and became a commercial artist. I never gave up on my passion of writing and as my children grew, I began to writer longer pieces. One Christmas, my children gave me my very own laptop so I didn’t need to compete for time on the only PC in our home. They were the first ones to believe in me and my stories and I am forever in their debt. Are you planning on writing another novel and if so, could you tell us a bit about it? I’m so glad you asked. I have my second novel coming out this week! A Horse Called Trouble is a tween horse story about a girl who must overcome her abusive past to save the defiant horse who has taught her to love and trust again. Abandoned by her mother at a young age, Tara Cummings has been passed from foster home to foster home; not wanted anywhere by anyone. At thirteen she’s skeptic and suspicious, with no family, and no friends. Horse therapy “will teach trust, perseverance, respect, and the value of teamwork,” or so says the program’s instructor. Tara is unconvinced. Trust only broke her heart, perseverance meant more failures, and no one respects or wants to team up with the misfit foster kid. At the farm, Tara meets Trouble, an angry and defiant horse, bent on destroying everything and everyone around him. Tara is frightened of the enraged horse, until she realizes Trouble is as misunderstood and untrusting as she is. Pushing aside her fear, a special bond is formed, much to the surprise of everyone at the farm. Trouble trusts Tara, and Tara in turn finds hope and acceptance as well as the will to love and trust again herself. But, Tara’s confidence is shaken as an even greater challenge looms ahead. Trouble’s mean and manipulative owner is the one and only Alissa, Tara’s nemesis. Can Tara overcome her own limitations and fight to save the horse who freed her heart and gave her life value and meaning? Or will Alissa destroy them both? I also have a third novel coming out in April. The Secret of the Stones is another tween fantasy. Merlin’s magic, enchanted stones and a mysterious prophecy thrust Alex into mystical mayhem with humorous consequences. This is the first of a series titled, The Lost Diaries of Northumberland. Thanks so much for inviting me here today, Trudy. It has been great fun visiting with you. Great questions! I am so thrilled you enjoyed Ghost Dog of Roanoke Island and I hope you like my new books just as much. Thank you for the wonderful interview. It is always so fun to find out what really goes into writing great children's books. The lives of three poor children intersect in a bond of friendship which promises to help each one in an unusual way. Told in third person narrative from each child's point of view, the harsh realities of late eighteenth/early nineteenth century America, are woven together with a hint of fantasy. Giuseppe is an orphaned street busker from Italy who is forced to work for a harsh padrone who mercilessly takes the boys earnings, giving him little in return. When green violin washes up on shore, Giuseppe finds the violin offers more than charming music. Frederick is rescued from an orphanage by a clockmaker and becomes his apprentice. With his ingenuity and determination, he builds an automaton of a fascinating clockwork man. When Hannah's father suffers a stroke, she is forced to work as a maid in grand hotel to help her family make ends meet. She becomes the personal assistant of an elusive and fascinating guest. In the course of her work, she learns of a mysterious treasure and dreams of what it could do for her and her family. As the children's lives come together, they discover they each hold a key that can help another. In his debut novel, Matthew Kirby delivers a strong steampunk story in beautifully written prose in which he skilfully builds the world and characters. The author also builds some interesting minor characters who, much to my disappointment, nearly disappear without warning near the end of the novel. The action of the story comes late in the novel and I would have loved to have the fantasy elements last a little longer. The recommended age is 8-14. I recommend THE CLOCKWORK THREE for the older end of the age limit as my twelve-year-old son thought it was slow, but my seventeen-year-old son loved it. To purchase this book, click the retailers links. 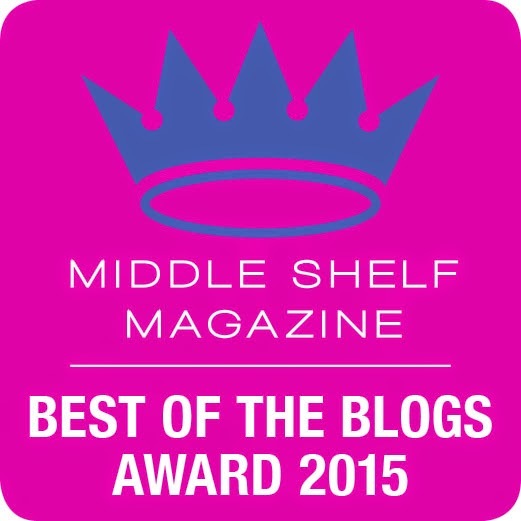 Winner will receive an author signed hard copy. **Disclosure: I did NOT receive a copy of this book from the publisher or author. The book for the contest was provided by me and purchased at The King's English Bookshop, my local independent bookstore.